Altitude range: Altitude around 700 metres above sea level. 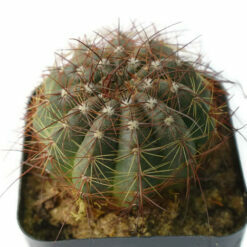 Habitat: This cactus grows in rocky soil, among grasses, in the shade of trees. 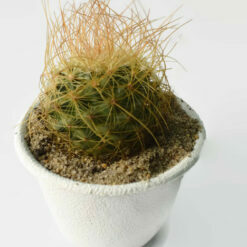 It grows often in association with Bromeliaceae. Discocactus crystallophilus Description: Discocactus crystallophilus is one of geographical or morphological forms of Discocactus placentiformiswhich is one of the most widespread and morphologically variable taxon. 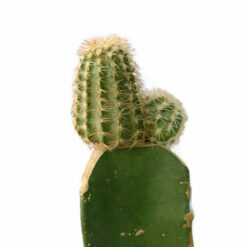 It is a solitary, flattened globose cactus that form a white cephalium at maturity. 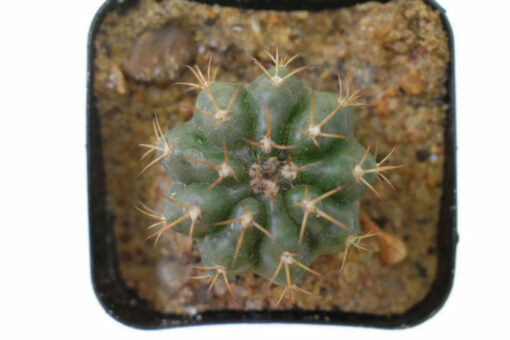 The names Discocactus crystallophilus is not accepted by many botanists that treat it as synonym, but it still has a value for a collector because they identify plants with particular characters. 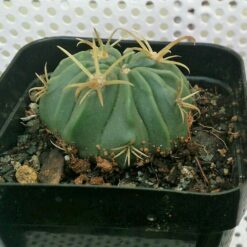 Stem: Shaped like a cake up to 6 cm tall (8-9 cm with cephalium), 15 cm in diameter. The epidermis is light green to brownish-green. 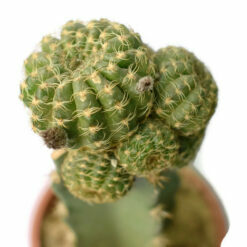 Areoles: About 4-6 per ribs in plants with cephalium, round. 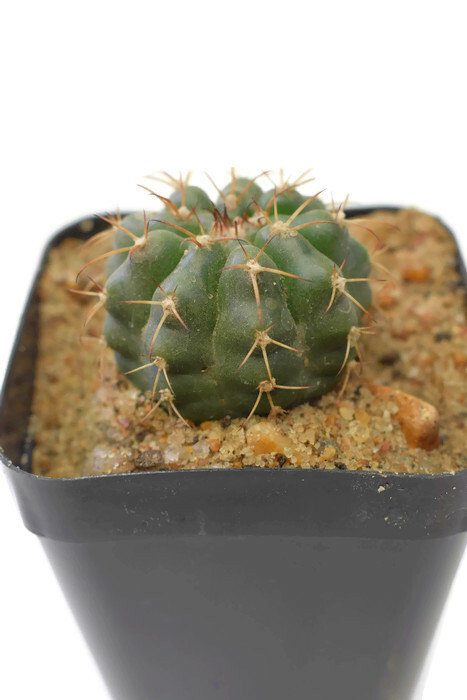 Spines: (3)5-7 (or more) brown-reddish to pale gray, slightly recurved backwards, lateral ones up to 2 cm long, lowermost one pointing downward up to 3 cm long. Uppermost spines (if present) shorter about 5 mm long. Flowers: Nocturnal, very fragrant up to 7-8 cm long, 6 cm in diameter. Stigma about at anthers level. 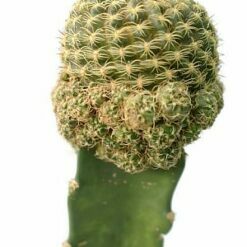 Blooming season: Flowers come in profusion in summer, out of the cephalium.Fruits: White or pale greenish-white. 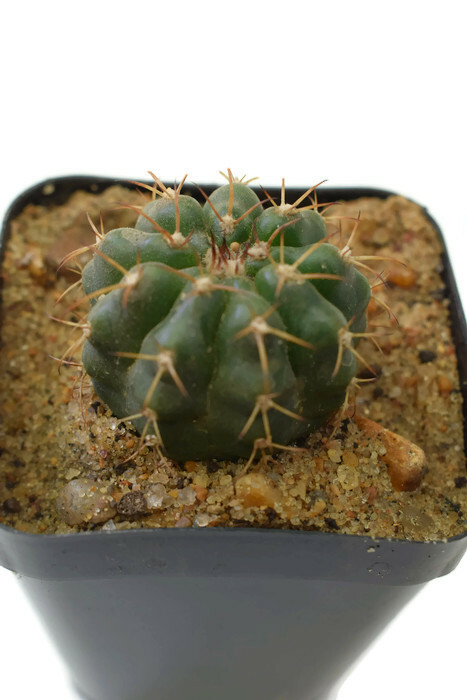 Cultivation and Propagation: Collectors consider this cactus genus from South America to be rarities as they are not the easiest plant to keep happy. 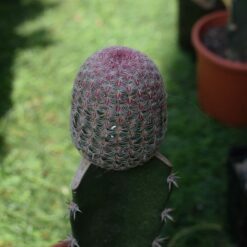 it is rather difficult to grow and frost tender, should be kept at above 15° C if grown on its own roots (8°C if grafted) need full sun or afternoon shade. 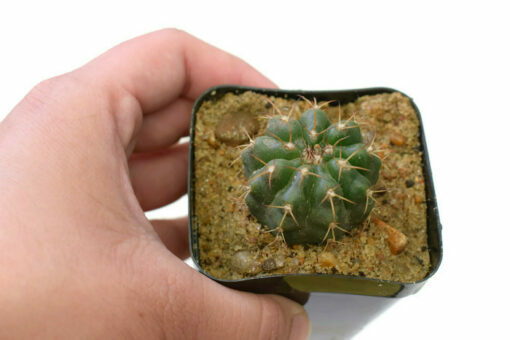 Young seedlings are generally grafted because they are slow growing and very rot prone when kept on their own roots and though they can’t endure long stretches of total dryness, too much water will rot them, as their weak root systems tend to be inefficient at sucking up water from wet soil. 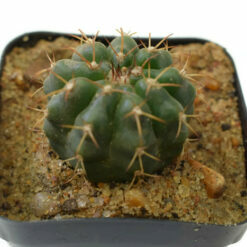 They generally resent being repotted and can take a long time to establish. Propagation: Seed. 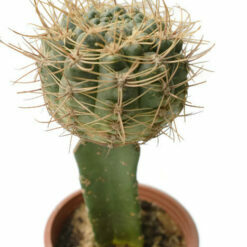 Young seedlings are often grafted on a low stock to keep the plant in a good shape.